I’m currently flying over Russia, and it’s still 6 hours to Amsterdam. Our two days in Hong Kong were awesome. Such a full on city. We touched down just after 9pm and we had to get out of the plane and onto a bus which took us to the terminal. It was quite surreal walking around with massive planes all about. We took the train to Hong Kong Island and ended up walking with all our gear to our hotel, was a massive mission, but we had just been sitting for 12 hours so it was a welcome stretch of the legs. The GPS wasn’t working for us (turns out if you leave your iPhone in plane mode it disables it) so I had to use the internal GPS, which turned out to be pretty good. We stayed at the Cosmo in Wan chi and when we arrived they upgraded us to a better room, which was nice, still small but that’s Hong Kong. Crashed out at around midnight and had a solid sleep until the internal alarm clock went off, at about 5 am. We hit the streets in search of some breakfast at around 6:30, turns out food is very cheap and very tasty. My breakfast of fish, French toast, scrambled egg and a coffee cost about $5NZD. We ended up walking all way back to central station in a city that was slowly awakening. The fish markets were a highlight, most of the fish were still alive, occasionally one would make a dash for freedom, jumping into the street only to be caught in a little net by a monger. We came across a student architecture display, some really cool presentation techniques which I’ll post photos of at some stage. We headed back to the hotel to plan the rest of our day. We decided that the Stanley markets on the other side of the island would be our next mission, we headed back into town walking in circles untill we found the pickup point for bus 40, all the time being overwhelmed by the shear intensity of the city, the high rise buildings, markets, people, sounds and smells are all extremes. All that changes as soon as exit a tunnel on the eastern side of the island, there’s still massive high rises scattered around but it’s much more laid back. Stanley bay is actially a very nice spot, much more our style, friendly people, more space, and the air isnt so thick like the city. I ended up buying a couple pairs of jeans and got a hair cut. In one of the stalls a lady was demonstrating one of those small remote controlled helicopters, one person asked how strong they were, so the lady raised one arm and smashed the toy to the ground, she then flew it back to her hand. After a nice relaxed afternoon we headed back on bus 40 to the city. We had duck for dinner, which again was insanely cheap, we then headed for a skate park that was over the road from our hotel, Simon was keen to try out his Smoothstar there (see video below). I took lots of photos as we hung out with some local French kids one of which had a board similar to Simons which got them talking. Then it was off to the 7-11 to grab a couple beers and slowly (again taking lots of photos) headed back to the hotel while Simon carved up the back streets. The next day we had Congee for breakfast (kinda like a meaty rice porridge served with a savory donut) and again wandered the city but this time we slowly made our way west to Kowloon. Along the way we came across our local basketball team, the Wan chi Devils, who were in a close battle in insainly hot and humid weather. We rode a tram and came across a very female dominated shopping mall on our way to the ferry. There must have been some kind of event, as this place was packed and I only counted about five men, incl ourselves. We also came across the Hong kong Apple shop, wow, Steve Jobs nailed retail too. Kowloon was quite different to Hong Kong island. People seemed a lot less laid back and friendly, especially compared to Stanley bay. Again we wandered semi-aimless. Kowloon park was nice, and it had free Internet, managed to contact people back home and update the old Facebook. 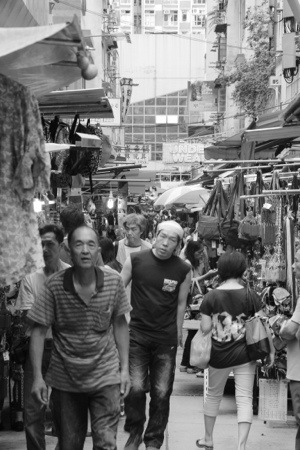 We headed back into the markets where I ended up buying a lens and Simon got a new camera. now we only had a few hours left before we had to go to the airport so we headed back via the ferry. The female dominated mall had now spread out into the street where they formed small groups and seemed to be doing a form of theater sports. One lady would be talking via megaphone while another acted something out, sort of like who’s line is it anyway. I’d love to know what it was all about, looked like a lot of fun. Yet again we walked all the way back to our hotel, stopping at the occasional shopping mall to cool off in the air conditioned environment. We took a Taxi back to the airport and after checking in I bumped into Oli Harmer, kinda freaky. It turns out he’ll be in Berlin around the same time I will too. Well I’m impressed you read all this, I might finish watching Hugo now. I actually sleeped for a few hours on the plane, I suppose the trick is to walk 10s of kilometers in insanely hot humid weather before getting aboard. 45mins from Amsterdam. Flying over Denmark. I can see all the places Paula and I traveled when we did our OE. The in-flight map stopped working so I was struggling to figure out where I was, until I saw Copenhagen. This is soo cool. Ahhh memories. Wish you were here sweet pea. Damn it’s clouding up now.